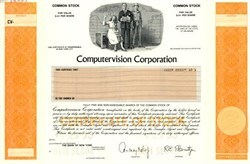 Beautifully engraved Specimen certificate from the Computervision Corporation printed in 1993. 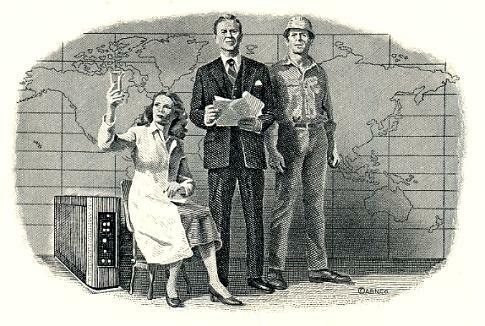 This historic document was printed by American Banknote company and has an ornate border around it with a vignette of 3 Company Employees in front of a World Map. This item has the printed signatures of the Company's Chariman and Secretary. Computervision Corporation is a leading international supplier of desktop and enterprise-wide product development software and services. For more than 25 years, the company's product and process data management (PDM) and design automation (CAE/CAD/CAM) software solutions have helped manufacturers improve product quality and reduce time to market. Computervision Services(R) provides best-practices consulting programs to support product development process reengineering and technology implementation. Computervision Services also supports applications, systems, and networks in heterogeneous computing environments. Computervision is headquartered in Bedford, Massachusetts, and provides sales and support services to its customers through its offices worldwide.